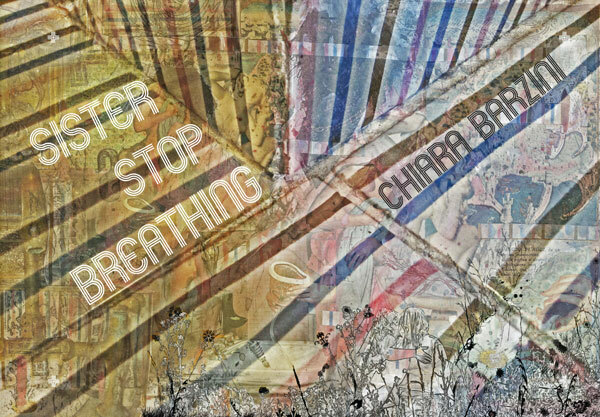 Chiara Barzini’s collection Sister Stop Breathing isn’t a lengthy collection, but its range of emotions and tones can be exhausting. Though these stories are, for the most part, brief, the shifts from realism to surrealism, from the American Southwest to urban Italy, can be dizzying. Like the collages that complement some of the stories, the full scope of the organization here can seem dense at first. What emerges is primarily rewarding, transporting the reader to a strange space between known qualities. Others take a more surreal position, sketching out visceral scenarios of bodies changing, of life and death becoming vaporous. One story here has the self-explanatory title of “Waking Up With Legs,” while the title story involves a unique way of disposing of the dead. A few of the stories find characters dying and unexpectedly adopting a sort of half-life: in the most striking of these, “Dead Pope,” the body of a deceased Pope vanishes from Rome, only to reawaken to a truncated half-life in isolation outside of the city. This collection serves as a slipstream calling card, an announcement of a new voice in weird fiction. And yet Barzini seems to have structured this collection with a different end in mind. After a long string of intentionally obscure (or obscured) tales, “Vauville” takes a much more realistic tone. It follows a young woman meeting with her estranged father, who decamped to France early in her life; the reunion that follows abounds with tensions of nearly every variety, and ends on a horrific yet ecstatic note. That uneasy combination of horror and ecstasy is what Barzini evokes best in this short collection; at its best, it leaves a strong and searing impression.